UPDATE The calendars are in. I will be sending out an email this evening to all who put their email address on the sign up sheet. I will also have them at the Incline Club this weekend. If you can’t make either I can try to get it to you another way, just drop me a line. For those of you that dropped me phone numbers, I’ll be calling. and last but not least..maybe least…where was I…oh, I have about 5 extras in case someone wants one who didn’t see it first time around. Thanks for taking interest in the stuff we do! 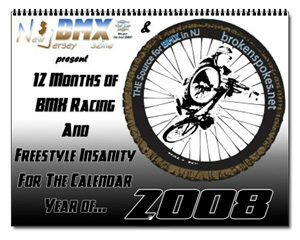 brokenspokes.net and NJBMX Szine are stoked to show you the 2008 BMXin in NJ calendar. 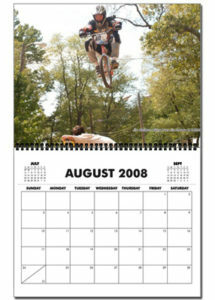 Available online (and if enough people say, “yea that’s cool” in the forums, at the comps, bike shops and races). I’ll have a sample at CJBMX on Nov 4th. Price online is $16.99, if I can get 15 people who want them I can get the price down to $15.00 and I’ll have em on me at the events. Check the cover and an interior shot and hit up the link to see all 12 months shots.